In the video game world of yesterday there were no online leaderboards, score tracking websites or social networks to brag to about high scores. Those who wanted that recognition in their local arcades had to claim the top spot on that machine’s high score table, where they could then be the champ for the day. Williams Electronics raised the bar within this 80s arcade world when their smash hit Defender became the first major hit that saved high scores even when the game was powered off. Many other Williams hits with this feature would follow, including 1982’s Joust, a game that allowed players to become warriors in a wild land of ostriches and lava. Kansas City’s Lonnie McDonald was one of those Joust warriors. Like many 1980s arcade warriors, McDonald aimed to post his name on top of every Joust machine he could find. McDonald hit his Joust high point in 1982 when he ran up over 37 million points by playing for 24 hours on one coin. Williams Electronics recognized his accomplishment with a t-shirt and a letter declaring him thier Joust World Champion. In 2011, some 28 years later he has come back to the game. Now aware of scorekeeping organizations such as Twin Galaxies, McDonald in 2011 had his personal Joust machine professionally serviced with plans to aim down several current world record scores. Since 2011, he has been travelling to the locations where the arcade classic can still be found to once again claim the top spots on as many high score tables as possible. In June 2011, McDonald took top honors at Brooklyn, New York’s famed Barcade, taking down the score of noted arcade champion Donald Hayes before hopping to High Scores in Burlington, NJ to do the same. He then returned to his home state to rack up over 12 million points at the 1984 Arcade in Springfield, MO then back to the east coast, where he racked up over 10 million points at a New York museum. 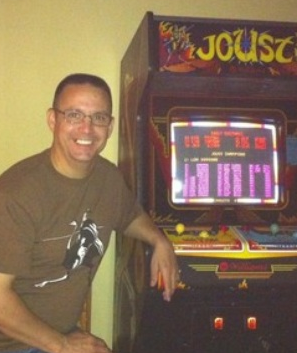 In the fall of 2011 Lonnie and gaming Icon Steve Sanders set the Guinness World Record and Twin Galaxies World Record for Joust Marathon Doubles. As of March 2019 McDonald had played 205 machines to 9999999 and set numerous records. He has played at least one Joust in all 50 states to 9999999. He was Inducted into the International VideoGame Hall of Fame and Named to the U.S National VideoGame Team. He stands as the only person over 50 years old to play over 50 hours.